The Tiger Touch Fader Wing offers 30 additional faders for instant access to all of your playbacks, fixtures and palettes. Programmable macro buttons and local, independent paging control make for intuitive operation of world class shows. Each fader is electronically labelled with a backlit LCD. 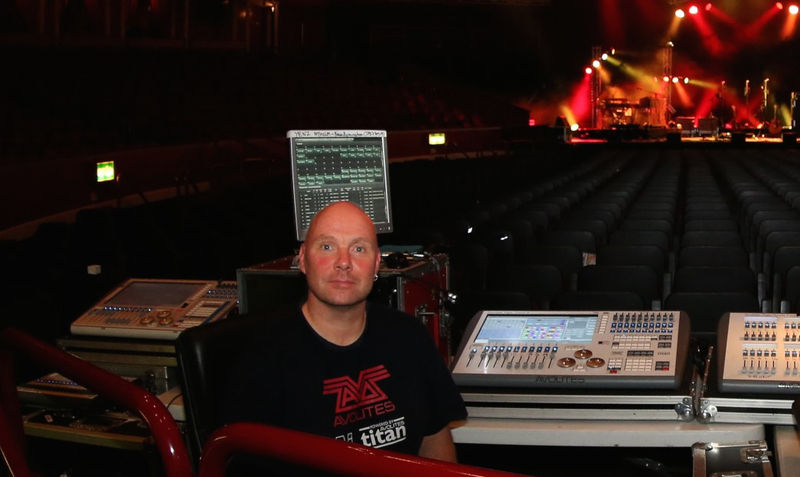 UK - Avolites aficionado and lighting designer Yenz Nyholm used an Avolites Tiger Touch II with Tiger Touch Fader Wing to create a retro look for English pop/rock band Level 42's gig at London's Royal Albert Hall. Nyholm's Tiger Touch II, running Titan v8, was used to control a varied design of rock gig, West End theatre, and big band with a distinctly 1980's feel.According to Nyholm, Level 42's lead singer and bassist Mark King's brief for the lighting was "Big colours" and "Old school". To achieve this, Nyholm specified a mixture of fixtures including Robe 600s, Robe LED beam 100s, Clay Paky Alpha Wash 700s, Chauvet Professional Tri Tour LED Par Cans, and Showtec Sunstrips. The rig was controlled and programmed by the Tiger Touch II and the Tiger Touch Fader Wing, which offers 30 additional faders for instant access to all of your playbacks and fixtures. "The Tiger Touch II is such an intuitive desk to use," says Nyholm. "The best thing for me is the cue stacking. You can display your cue list and each individual cue's parameters on the screens, but better still you can go in and change every parameter without having to be in the cue itself. This has been a massive time saving device and made making changes very simple and efficient." The Tiger Touch II is based around a large touch screen with high quality switches, encoders and faders. It offers 20 submasters separately paged as two banks of 10 and a further 10 macro or executer buttons, and harnesses the power of Titan. It also includes the popular pixel mapper feature. "Almost half of my cues are pixel mapping," says Nyholm. "This enables me to achieve fantastic effects and colours running across - anytime I want a scrolling effect or any kind of effect going in and out or up and down, the pixel mapper is just the easy way to do it. I love the way it's laid out and so easy to access." Following the release of their Sirens EP, Level 42 embarked on an 18-date UK tour, culminating in this special show at the Royal Albert Hall, and a 16-date EU tour. All dates on the EU tour were lit with house rigs, making use of Titan v8's fixture exchange function. "This feature made it easy to adapt the rig every day,"
UK - More than 20,000 music fans witnessed the Red Bull Culture Clash at London's Earls Court where four music crews battled it out amidst lighting controlled by Avolites Sapphire Touch and Tiger Touch II consoles and networked by Avolites Titan Net Processors. Jamie Corbidge was the LD for the event, with equipment supplied by Storm Lighting. He had overall control from his Sapphire Touch as competitors including Harlem rap squad A$AP Mob, grime collective Boy Better Know, Jamaican reggae act Stone Love and Rebel Sound, and a collaborative made up of bass superstars Chase & Status with MC Rage, World Clash champion David Rodigan and jungle pioneer Shy FX performed. Stephen "Sven" Jolly operated for Boy Better Know and Stone Love on two of the four stages, jumping from one Tiger Touch II to another. Shaheem Litchmore was LD for A$AP Mob, using a Tiger Touch II for the first time. The event was produced by Smyle, with Avolites' Stephen Baird-Smith and Peter Budd on-hand for console and Titan Net support. "Jamie owns his own Sapphire Touch, and he wanted to build a complete Avolites system around his console, so Storm Lighting supplied the further three Tiger Touch IIs and Fader Wings," says Baird-Smith. "As each set during the vocal battle was unscripted, Jamie knew he needed the console set up to be flexible, reliable, and talk to each other as he also needed to be able to force each stage to a red state once the time was up at the end of each round." The networking functionality of Titan version 8 allowed each stage to have a console and an operator, while the Sapphire Touch master console could run the entire room for an introduction sequence and in between the various rounds. "In addition, the Titan interface with quick sketch legends meant it was easy for visiting American LD Shaheem Litchmore to get a very polished show programmed in just an afternoon with no formal training on the console," adds Baird-Smith. In total, six Avolites Titan Net Processors (TNP) were used on the show, with a fibre link connecting the consoles to the processors at either end of the room. These worked to share the processing load of the master console for the intro sequence, then ran S-ACN to DMX for the individual setups. "This was because we also had to incorporate Hog consoles for TV keylights, and for one of the four stages," says Baird-Smith. "The flexibility of the TNPs allowed one Avolites console to run the whole system, and a combination of Avolites and other brands to run the rig in individual sections." Corbidge comments: "I've used my Sapphire on a huge range of shows, and it's still my favourite console to operate. The Avolites team take on board any feedback that I have and I know some of the functionality I've requested is already being worked on. Their support on this project was invaluable." As well as the 20,000-strong crowd at Earls Court, the event was also streamed live, with more than a quarter of a million votes cast from people watching online. The hashtag #CultureClash also trended globally on Twitter. Rebel Sound were voted champions of the night, winning three of the four rounds, and were a clear favourite with the live stream audience.